The relationship between atmospheric blocking over Europe and the Atlantic eddy-driven jet stream is investigated in the NCEP/NCAR Reanalysis and in a climate model. This is carried out using a bidimensional blocking index based on geopotential height and a diagnostic providing daily latitudinal position and strength of the jet stream. It is shown that European Blocking (EB) is not decoupled from the jet stream but it is mainly associated with its poleward displacements. Moreover, the whole blocking area placed on the equatorward side of the jet stream, broadly ranging from Azores up to Scandinavia, emerges as associated with poleward jet displacements. 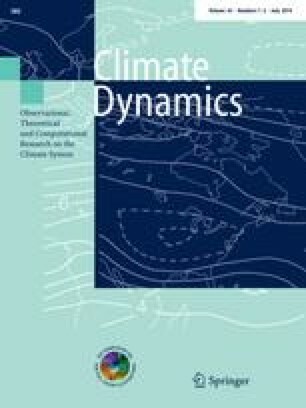 The diagnostics are hence applied to two different climate model simulations in order to evaluate the biases in the jet stream and in the blocking representation. This analysis highlights large underestimation of EB, typical feature of general circulation models. Interestingly, observed blocking and jet biases over the Euro-Atlantic area are consistent with the blocking-jet relationship observed in the NCEP/NCAR Reanalysis. Finally, the importance of sea surface temperatures (SSTs) is investigated showing that realistic SSTs can reduce the bias in the jet stream variability but not in the frequency of EB. We conclude highlighting that blocking-related diagnostics can provide more information about the Euro-Atlantic variability than diagnostics simply based on the Atlantic jet stream. The authors would like to deeply thank Stefano Tibaldi, Andrea Alessandri, Fabio D’Andrea and Tim Woollings for the constructive comments and useful suggestions, which have helped improving this manuscript. Special thanks are due to Giuseppe Zappa for the long-lasting and helpful discussions. We acknowledge the WAVACS COST ACTION ES0604 for providing support to Paolo Davini for a STSM to Reading and Oxford. Chiara Cagnazzo was funded by the European Commission’s 7th Framework Programme, under Grant Agreement number 226520, COMBINE project. We gratefully acknowledge the support of Italian Ministry of Education, University and Research and Ministry for Environment, Land and Sea through the project GEMINA.